I invented this recipe last night when I wanted something a little different, but also quick. It was a hit, as most pasta dishes are at our house. Here’s what you’ll need. As always, feel free to substitute and change out ingredients for what you have available. I thought mushrooms would be good in this, if you like them. Cook the pasta according to the directions. Brown the sausage and drain the fat. In a saucepan, cook the onion and garlic in the butter until soft. Whisk in the half & half. Then stir in the cheeses and let them melt into the sauce over low heat. I didn’t really measure any of the sauce ingredients, but went by what I thought looked good. I also added salt and pepper. When the pasta is cooked, drain it and put it back in the cooking pot. Add in the sausage, sauce and roasted red peppers. Serve it with garlic bread and salad. We had some left over for lunch today and I thought it tasted even better. The flavors were more pronounced today. I’ll be making this one again! Looks yummy, and super easy. You know, I really like that you snap a picture of the ingredients before you start preparing your dish. 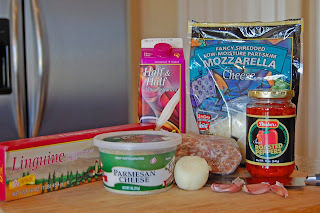 Pasta, cheese AND Italian sausage? I’m all over that! Thanks for the recipe! C'mon, you are making me hungry. I'm actually full from dinner and in trying not to eat any more m&m's, I'm drinking some tea. And I stumble on your blog. HO!! Glad it is not here. 🙂 Fabulous!! Ditto what Mrs. Jelly Belly said. YUM! This sounds great! My family would love this! This looks fantastic! 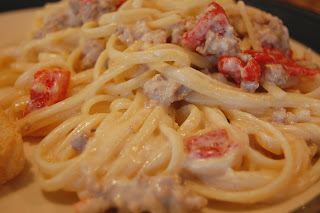 I love pasta dishes with sausage. Oh Man! That looks sooooo delicious. Does look like an interesting dish. I think I’d do without the mushrooms but my hubs would like them. I might make this tonight…looks yummy. I made this tonight and it was really good. I thought my Italian Sausage was a little spicy though. I guess it would work with burger too? I made this and thought it was delish. And yes, it was even better the next day. Althought I had to substitute 1 cup evaporated milk and 1 cup whole milk for the 2 cups half and half because I didn’t have any. It did not make it any less flavorful. Tried this recipe and it was great. I used “Aidell’s Italian Sausage with mozarella cheese” from Costco and it was delicious. It complimented the mozarella in the sauce. I couldn’t find the roasted red peppers in my area so I substituted with regular red peppers. A Pinot Grigio wine was served and everyone loved the meal. Thank you! I’ve never cooked Italian sausage because I hate fennel & caraway seeds. Is there such a thing as Italian sausage without them? If not, do you guys think bulk pork sausage would work OK? Not having eaten Italian sausage except for tolerating it on a Pizza Hut pizza, I don’t have a clear recollection of the taste to know what could be substituted. 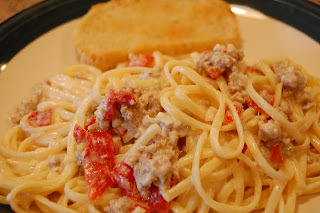 You could use regular sausage or just plain ground pork, turkey or beef. We had this last night, it really was good. I should have made some extra sauce because I made this in the morning and stuck it in the fridge, causing the pasta to soak up much of the sauce. Because, my husband likes sauces …(“swimming in sauce”) . Everyone liked it very much . Verdict: Recipe is a keeper ! Myself & the family liked this! I did not have the peppers, so I used a jar of sun-dried tomatoes instead, and used its oil instead of the butter for the sauce. Yumm-o! Oh, also threw in a packet of Good Season’s Italian Dressing Mix into the meat. Will make again! hey I LOVE this recipe, made it twice. I can never seem to get the right proportions of pasta for the sauce though. Any advice on how much pasta to use? Sarah, I use a whole pound of linguine. I edited the recipe to show that. You may like a different proportion though. My family LOVED this one. I got a little heavy handed with the onion, but that’s on me. GREAT recipe! Oh and I used macaroni noodles to keep the kids happy. Made this tonight and it was fabulous!